Ok I think its time to update my BCS Bowl predictions. After sitting watching football all weekend I think I may have a little bit more of a hunch of who will be where. Even though, I do have doubts if TCU should play in either the Fiesta or Rose Bowl. Back on September 29th I made my NCAA Football Bowl Predictions… Well lets just say I was a little bit off on the teams I picked. This week in college football has been a rocky road. And at the completion of the week we will find ourselves having to watch a bunch of unappealing games. No I won’t consider the Auburn game as one of this weeks must anticipated games. Mr. Newton on the other hand will… However, there is a game in the SEC this week that intrigue me a little bit. The Tennessee vs. Ole Miss game is underrated but it would be great. Hahaha…that was a joke however, I will allow you to see the preview. Other games that are really important at least slightly are the Virginia Tech vs. North Carolina, Oklahoma State vs. Texas, Penn State vs. Ohio State (game of the week), TCU vs. San Diego State, Oregon vs. California games. Let’s get prepared for this weekend’s college football games. We are indeed in store for some great games that will shake up the BCS. The two games that interest me are the Alabama vs. LSU game and the TCU vs. Utah game. The Utah, TCU game isn’t going to get much hype in the broad sports culture, due to its commercial appeal. However, this game will likely determine at least one team that will compete in the BCS Championship game. Of course there is a group of individuals that disagree with me. My argument is simple look at the remaining schedules of each team and both of their positions are it relates to the polls. It would be hard to argue that they won’t be in the Championship game. Another possible historical game this weekend is the Northwestern vs. Penn State. Head coach Joe Paterno is going for his 400 th victory. 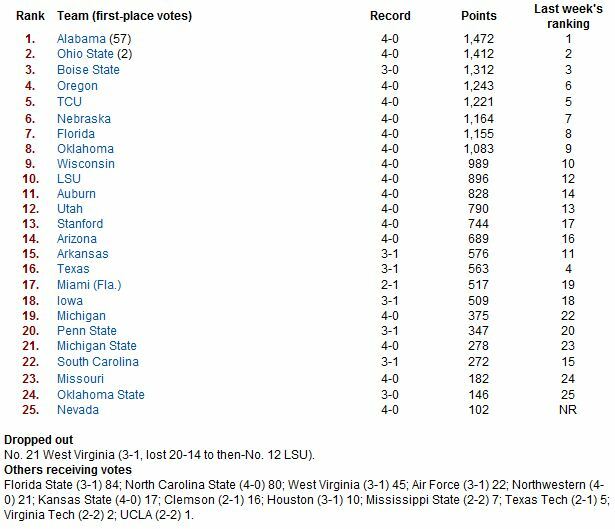 Not many changes in this week’s USA Today Coaches’ Poll. Oregon Ducks have made a steady climb since the preseason to No. 4. Texas fell 12 spots from No. 4 to No. 16. 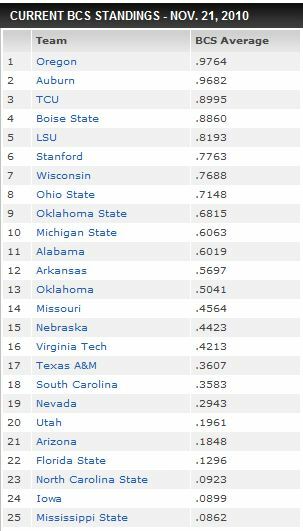 West Virginia falls out of the Top 25. 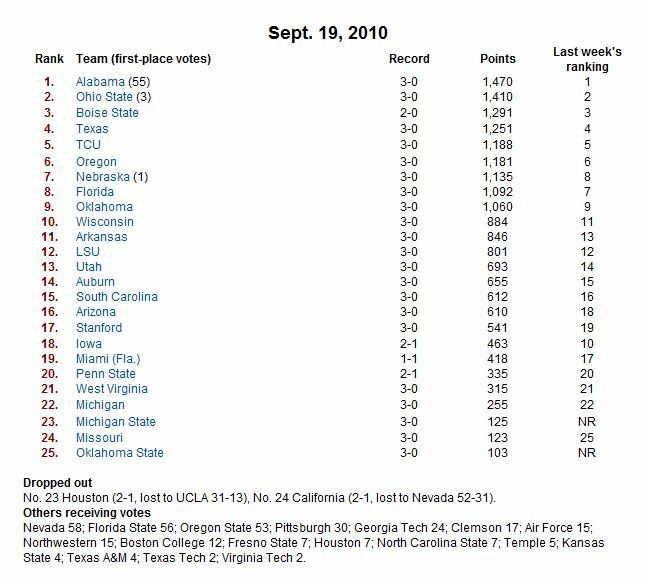 And Nevada ranked in AP Poll for first time since 1948. 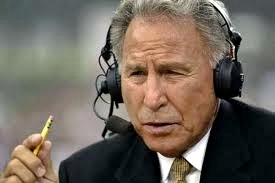 Lee Corso is known for making crazy picks on ESPN’s GameDay. Last weekend Corso made a prediction that the #6 TCU Horned Frogs will lose to #24 Oregon State by three touchdowns. Well little did he know the Head Coach of the Horned Frogs was watching their show. Head Coach Gary Patterson made sure they did. He sent a text message to the host of the show Chris Fowler. The text read, Lee [Corso] 3 touchdowns?